Whether through writing, painting, or sculpture, I have always felt the desire to address my feelings towards the Earth, mankind, and the universal spirit. I feel that as true artists, we have a duty not only to create new and beautiful things, but also to communicate our feelings as we search for the truth to our existence. As artists, we were given a gift. We have an inborn ability to observe our world from a different angle, from a different perspective. I feel strongly that because of this, we have a much sharper awareness of our surroundings, hence a more acute sensitivity as to how we relate to, and view life. True artists are deep thinkers and philosophers, and our work should stem from that awareness and vision. Accepting this, I feel a certain debt and duty towards the world, and my offering of gratitude for being part of it is the work I do, day to day, striving towards the truth, accepting my reality, and proposing my vision. It is not a choice; it is what I am. My work stems directly from the pursuit of truth. Whether inspired by the beauty I witness around me, or something as ominous as our destruction of the environment, it is all about true inner feelings and observations, and the need to address them. Artist Patrick Schiavino pictured with Sting at the Rain Forest Benefit Opening at the John McEnroe Gallery where he was a featured artist. The show, which took place in May 1998, raised over $30,000 for the charity. 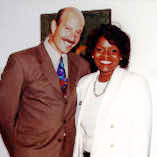 Artist Patrick Schiavino pictured with New Jersey Governor Christie Whitman at the 1997 Governor's awards ceremony. Artist Patrick Schiavino pictured with New Jersey Secretary of State Lonna Hooks at the State House in Trenton, where the artist was honored to do a solo exhibition in the Secretary's Rotunda.